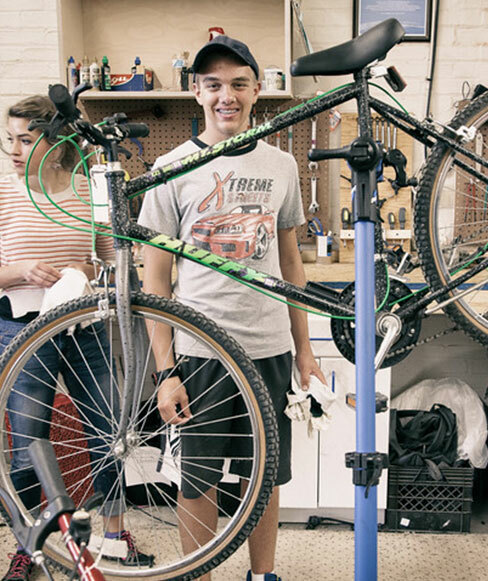 Our Youth Bike Workshop provides open shop time for youth to come and use shop amenities during designated times, keeping their repair skills sharp, and their bikes riding smoothly. Our Youth Bike Workshop is an after school program taking place every Wednesday afternoon from 3:30-5:30 PM. Shop space and tools may be used by kids 17 and under on a first come, first serve basis. Staff and/or volunteers will be present to help guide repairs, and used parts are available for $1. The Common Wheel was involved in every step, from the bike I built myself and rode, to the strength of my legs. I would never have discovered my love for bicycles without The Common Wheel. This program wouldn’t be possible without generous donations from people in our community, people like you. Have a bike you don’t use anymore? Want to help others adopt biking in their everyday lives? Spread the love and donate today!